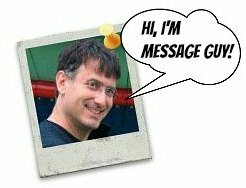 The best collections of Dad birthday wishes give you enough options to choose birthday messages for fathers of any kind. That's the kind of choice I have here. 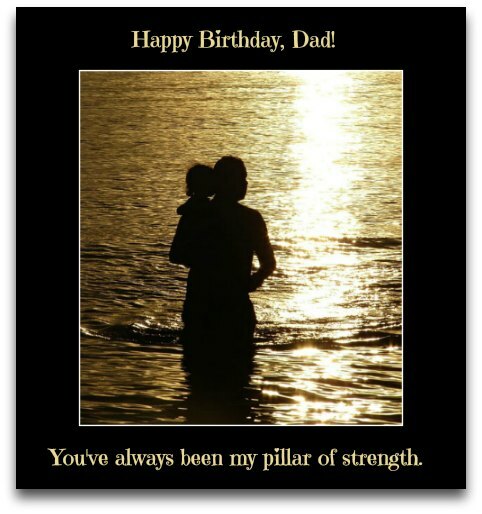 The birthday greetings for fathers on this page each give you a slightly different way of telling your Dad how much he means to you. Whether your father is the sentimental, inspirational or funny type, you'll find Dad birthday messages that make yours feel amazing on his special day. I'm so lucky, grateful, blessed and happy to have a Dad like you. I don't only love you, I like you. Happy birthday! Thanks for always believing in me, especially when I didn't believe in myself. Your confidence in me has always given me the confidence I needed. Happy birthday, Dad! Dad, thanks for all the support that you've given me...without expecting anything in return, except my happiness. Happy birthday! Happy birthday to a Dad who, more times than not, knows just what to say to me, plus when, where and how to say it. You're a master at words. What an enormous gift to have. Happy birthday, Dad! You've always said that no matter what happened to me, good or bad, I would always land on my feet. Just those words of encouragement alone have allowed me to land on my feet ever since. I know you don't pick your parents but I just want you to know that, if I could, I would have picked you to be my father. Happy birthday, Dad! Thank you for being a kind and loving Dad, especially those times when I needed you to be one the most. Happy birthday! I love you, Dad, for more reasons than I can count. The #1 reason is the most important one: you're my hero in every way. Happy birthday! You've always beamed your light in my darkest hours, helping me find my way by your shining example. Happy birthday, Dad! May God smile down on you, lifting you higher through good times and carrying you through the bad. Happy birthday, Dad! When I grow up, I want to be just like you...a great Dad, a great husband, a great friend and a great person. Happy birthday, Dad! Still on the lookout for the perfect wish? It's just like you always told me: everything I'll ever need in life I can probably find on TV! Thanks for teaching me the real facts of life! Happy birthday! I consider myself lucky because I have an amazing friend, an amazing teacher and an amazing hero...like you, Dad. Happy birthday! You not only made me, you also made me what I am today: a happy and healthy person with a rich, full life. Thank you. Happy birthday, Dad! You've always helped me face every hurdle, every disappointment and every struggle with dignity. You're my pillar of strength. Happy birthday, Dad! Every time I fell, you picked me up. Every time I tried to quit, you made me try harder. Because of you, I have a rich life in more ways than one. You're the best Dad. Happy birthday! No matter how hard I try, no matter what I do, I'll never be able to thank you enough for all your love, care and patience But I will try. Happy birthday, Dad!